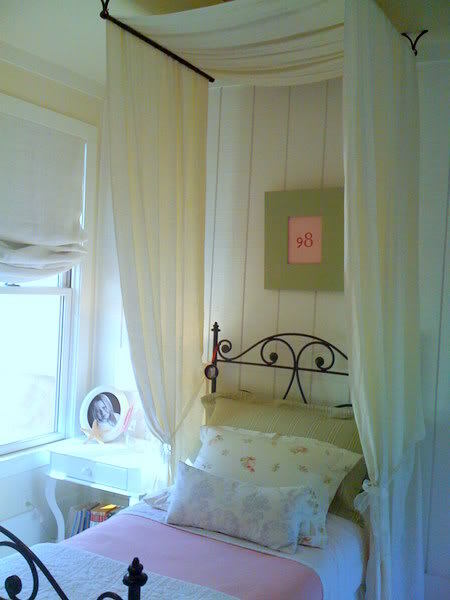 Here's one for the files...if you notice, the canopy in this sweet little girl's bedroom is suspended from towel bars. So clever!!! To see more go here. That is SUCH A GOOD IDEA!! My niece has been begging for a new canopy above her bed. I think I just found the perfect suggestion for my sister. Thanks for sharing! So pretty, that would look good over a big girl bed too! That is adorable! What a clever idea :-) Thanks for sharing with us. What a beautiful simple idea!! I want to use basketball hoop netting and do it around my boy's beds! What a lovely idea...thank you for sharing! I've been looking for ideas to spruce up our soon to be nursery. We're trying not to spend an arm and a leg before the little peach even gets here so this is a great tip. feels like it's been ages!!! beautiful post! hope all is well. Love it! My daughter keeps asking for a canopy bed - this might be doable. Thanks for sharing!